There was certainly no lack of excitement today with all eyes glued to the courts as the junior tennis world showed a glimpse into the future of college tennis. Lauren Embree picked up her second consecutive silver ball when the No. 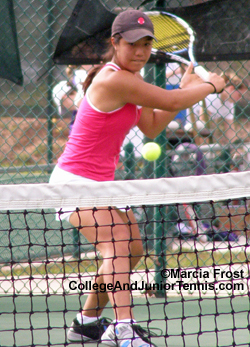 2 seed fell to Kristie Ahn. It was a match that went on long past the other straight set contests as the points and games seemed endless. But there was an end, and Kristie had it in a 6-4,6-3 win that doesn't begin to tell the fight Lauren Embree put up. Though it wasn't a gold one, Lauren Embree's coach Julie Steven -- a former junior tennis standout herself -- told me this was Lauren's 23rd ball! 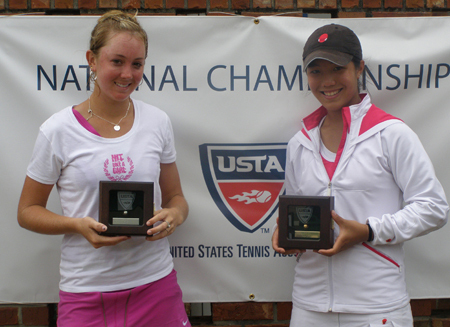 And for 15 year old Kristie it was a memorable first trip to this event and a step closer toward evening her win-loss record against Lauren (which is still in Lauren's favor. 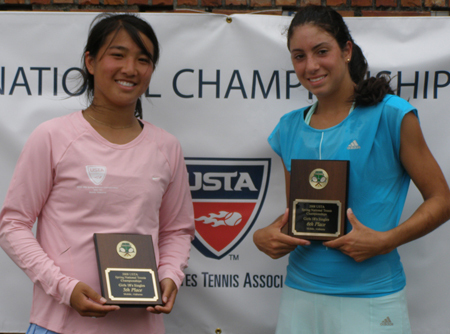 The only match that finished after the girls final was between Kristie Ahn's fellow New Jersey native Christina McHale and Keri Wong in the fifth place playoff. Future Clemson Tiger Keri just edged the 15 year old Christina in a tough battle that went all the way to a 6-7(2),6-2,7-5 finish. 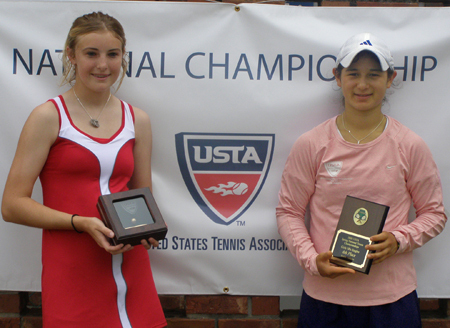 In the girls third place playoff, two 16 year olds went at it for the 18s trophy. Lilly Kimbell and Hanna Mar were on the opposite courts as the other girls so I didn't see much of the match, but it certainly wasn't quick even though Lilly's winning score was 6-2,6-1. One silver and one gold. That's what Dennis Nevolo did last year and this time he repeated the feat -- in reverse. 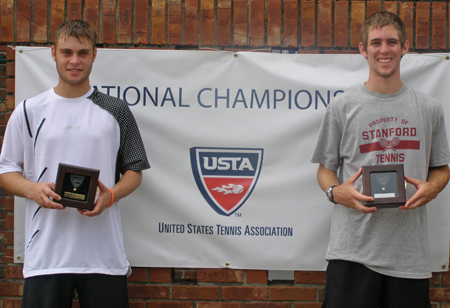 Yesterday, Bradley Klahn and partner Steve Johnson defeated Dennis Nevolo and Evan King in the doubles final and today it was Dennis who took first place. As near perfect as top-seeded Bradley has been this past week -- he didn't lose a set before today -- the No. 2 Dennis Nevolo was even better today. From the his break in the first game of the match, he was the one in charge until the final point. There was certainly some trademark forehand winners by Bradley, however, Dennis seemed to pull them out constantly -- whether from the baseline or at the net. 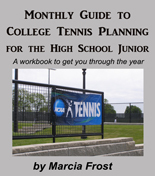 The shots were as varied as they were perfect and it could be a preview into next year's college tennis season when Dennis plays for the University of Illinois and Bradley heads to Stanford. 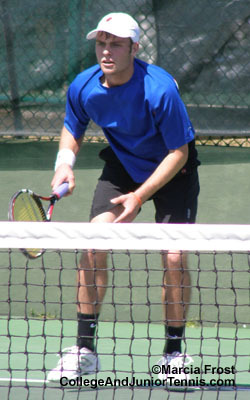 Last year's singles winner Brennan Boyajian may have fallen in the semis, but he wasn't going out today. 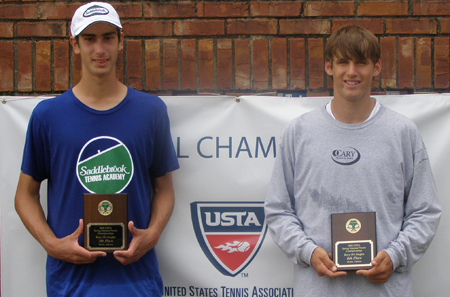 Brennan, who will join the North Carolina Tar Heels in the fall, took home the bronze this year after taking out Drew Courtney in the third place playoff, 7-5,6-3. Drew will certainly face Brennan again as he will be playing for the University of Virginia. Alex Domijian was victorious over incoming Georgia Tech freshman Kevin King for fifth place, 6-2,6-2. The 16 year old went home with the same trophy last year. It was another perfect tournament at the Mobile Tennis Center as I enjoyed the fourth (and my fourth) USTA National Spring Championships. Scott and Lorraine Novak have just kept improving a great event each year and I look forward to 2009. P.S. Click for more photos and Talking With interviews from Lauren Herring, Bradley Klahn, Kristie Ahn, and Sekou Coker Bangoura to come soon.